Elvis Presley Top Hits Vol. 10 Japan EP Larger image below. Mega-rare original Japan-only media sampler promotional EP housed in the original custom wraparound plastic casing. One of the rarest Elvis records ever released anywhere in the world put out by RCA Victor Japan to promote Elvis and other RCA artists. Songs include All Shook Up, Butterfly, Round And Round, Chantez Chantez. Both the record labels and unique cover are in stunning near mint condition. This is the first time we have seen this EP in 40 years. This is written in stone!!! Paul Lichter's Elvis Unique Record Club was founded in 1970 and has been supplying Elvis fans worldwide for four decades. Paul has written 30 books about his friend Elvis and has often been called the world's leading Elvis authority. Whether you are looking for Elvis' first Sun recording, an authentic autograph or a photo of Elvis performing at a concert in your hometown, chances are you will find it as part of our large inventory of mint Elvis original treasures. This is written in stone!! Once you leave feedback for us we will respond by leaving feedback for you within 24 hours. We care and will always take that extra measure to satisfy you. Elvis Unique Record Club 10933 East Elmwood Street Mesa, AZ 85207. 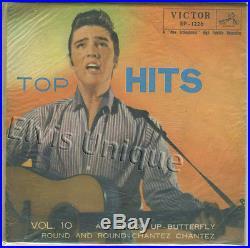 The item "Elvis Presley Top Hits Vol. 10 Japan EP" is in sale since Wednesday, July 12, 2017. This item is in the category "Music\Records". com" and is located in Mesa, Arizona. This item can be shipped worldwide.